Batu Caves is a limestone hill, which has a series of caves and cave temples, located in Gombak district, 13 kilometres (8.1 mi) north of Kuala Lumpur, Malaysia. It takes its name from the Sungai Batu or Batu River, which flows past the hill. Batu Caves is also the name of the nearby village. 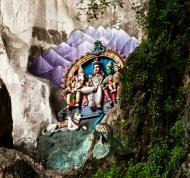 The cave is one of the most popular Hindu shrines outside India, dedicated to Lord Murugan. It is the focal point of Hindu festival of Thaipusam in Malaysia which attracts over 1.5 million pilgrims yearly, making it one of the largest annual gatherings anywhere in the world. Batu Caves was promoted as a place of worship by K. Thamboosamy Pillai, an Indian trader. He was inspired by the 'vel'-shaped entrance of the main cave and was inspired to dedicate a temple to Lord Muruga within the caves. Standing at 42.7 meter (140.09 ft) high, the world's tallest statue of Murugan, a Hindu deity, is located outside Batu Caves, near the city of Kuala Lumpur, Malaysia. The statue, which cost approximately Rupees 24 million, is made of 1550 cubic metres of concrete, 250 tonnes of steel bars and 300 litres of gold paint brought in from neighboring Thailand. Rising almost 100 m above the ground, Batu Caves temple complex consists of three main caves and a few smaller ones. The biggest, referred to as Cathedral Cave or Temple Cave, has a 100 m-high ceiling, and features ornate Hindu shrines. To reach it, visitors have to climb a steep flight of 272 steps. At the base of the hill are two more cave temples, Art Gallery Cave and Museum Cave, both of which are full of Hindu statues and paintings. This complex was renovated and opened as the Cave Villa in 2008. 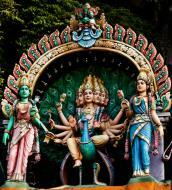 Many of the shrines relate the story of Lord Murugan's victory over demon Soorapadam. An audio tour is available to visitors. The Ramayana Cave is situated to the extreme left as one faces the sheer wall of the hill. On the way to the Ramayana Cave, there is a 50-foot (15 m) tall murti of Hanuman and a temple dedicated to Hanuman, the noble monkey devotee and aide of Lord Rama. The consecration ceremony of the temple was held in November 2001. Temple is managed by the Board of Management of Sri Maha Mariamman Temple Devasthanam, which also manages the Sri Mahamariamman Temple, Kuala Lumpur and the Kortumalai Pillaiyar Temple. It also performs the role of Hindu Religious Consultant to the Government of Malaysia in determining the Hindu yearly calendar. There are various undeveloped caves which contain a diverse range of cave fauna, including some unique species, such as Liphistiidae spiders and Eonycteris and Rousettus fruit bats. The site is also well known for its numerous macaque monkeys, which visitors feed - sometimes involuntarily. These monkeys may also pose a biting hazard to tourists (especially small children) as they can be quite territorial. Below the Temple Cave is the Dark Cave, with its amazing rock formations and a number of animals found nowhere else. It is a two-kilometer network of relatively untouched caverns. Stalactites jutting from the cave's ceiling and stalagmites rising from the floor form intricate formations such as cave curtains, flow stones, cave pearls and scallops which took thousands of years to form. Icons carried in procession during Thaipusam at Batu Caves. Also seen in the background is the 42.7 m high golden statue of Lord Muruga. Batu Caves serves as the focus of the Hindu community's yearly Thaipusam (Tamil: தைபூசம்) festival. It has become a pligrimage site for not only Malaysian Hindus, but Hindus worldwide from countries such as India, Australia and Singapore. A procession begins in the wee hours of the morning on Thaipusam from the Sri Mahamariamman Temple, Kuala Lumpur leading up to Batu Caves as a religious undertaking to Lord Muruga lasting eight hours. Devotees carry containers containing milk as offering to Lord Muruga either by hand or in huge decorated carriers on their shoulders called 'kavadi'. After a bath in the nearby Sungei Batu (Rocky River), the devotees wend their way to the Temple Cave and with remarkable endurance they climb the flights of stairs to the temple in the cave. Devotees use the wider centre staircase while worshippers and onlookers throng up and down those balustrades off on either side. Housing development began since 1970 with housing estates such as Taman Batu Caves, Taman Selayang, Taman Amaniah, Taman Sri Selayang, and Taman Medan Batu Caves. In the last decade, the surrounding area has changed from a small villages to industrial estates and new housing and shops. There is also an elevated flyover over the highway. A new RM515mil KTM Komuter rail extension from Sentul to Batu Caves is expected to be completed in May 2009.